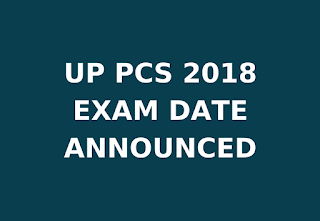 PCS Pre Exam Date 2018 – A good news for PCS test takers, in our present article, we will tell you that Uttar Pradesh Government has announced PCS Pre Exam Date 2018. In today’s article, we will tell you what will be the PCS Exam Schedule? All of you will know what is PCS Exam Date 2018, through the below given article. The demand for declaration of the date of 2018 PCS Preliminary Examination of Competitive Students has finally ended on Friday. The Commission has issued PCS Exam Schedule 2018, which will be conducted from July to December, while pausing speculation. According to the PCS schedule, the preliminary examination has been decided on August 19| While the review officer will be held in the Chief Executive of the Executive Review Officer, 2017, from November 25 to 3 days. The Secretary of the Commission, Jagdish told that in the special circumstances, the date of examination will be changed. Written Exam will be Subjective (Conventional) as well as objective Type. Optional Subjects (any one) Question Papers will be of 03:00 hours.